To read a record review that calls a Muse album “ridiculous” feels redundant. It is a Muse album therefore it is inherently ridiculous. What makes a Muse album good or bad is if they manage to incorporate their sci-fi themes without being cheesy, if they can contain their grandiosity so it sounds more like arena rock than Rush fan-fiction, and if they can write pop songs without sounding like they are pandering to the charts. Their last album, Drones, maybe showcased Muse at their worst; on their eighth album, Simulation Theory, the band attempts to correct that to varying success. If you have paid attention to the parade of singles released leading up to the album, you have already heard the range of Muse pop songs and pure attempts at chart-topping. “Thought Contagion,” the highest charting single from the album, is the band at their most poppy and least Muse-y. The hand-clapped beat of the verses give way to a chorus that sounds more like Imagine Dragon than anything Muse has ever done; it ends up feeling aspartame sweet which is saying something considering other tracks on the album are co-written by pop royalty like Timbaland and Shellback who most recently co-wrote nine songs on Taylor Swift‘s Reputation. On the other hand, “The Dark Side” shows restraint in not losing what has made Muse. With greater commitment to guitar work and an 80s vibe that matches the album’s Stranger Things-esque cover, the song harkens back to Absolution-era Muse. “Pressure” is similarly guitar-driven but a little poppier; it should still appeals to fans of Muse’s earlier work. There are a couple songs that really make you wonder what Muse are thinking. Closing track, “The Void” sounds like 80’s video game music until a piano-ballad breaks out a minute before the song ends. The track still works on some level unlike the Timbaland produced “Propaganda” which sounds somewhere in between Queen and Prince before some acoustic slide guitar completely breaks that vibe. 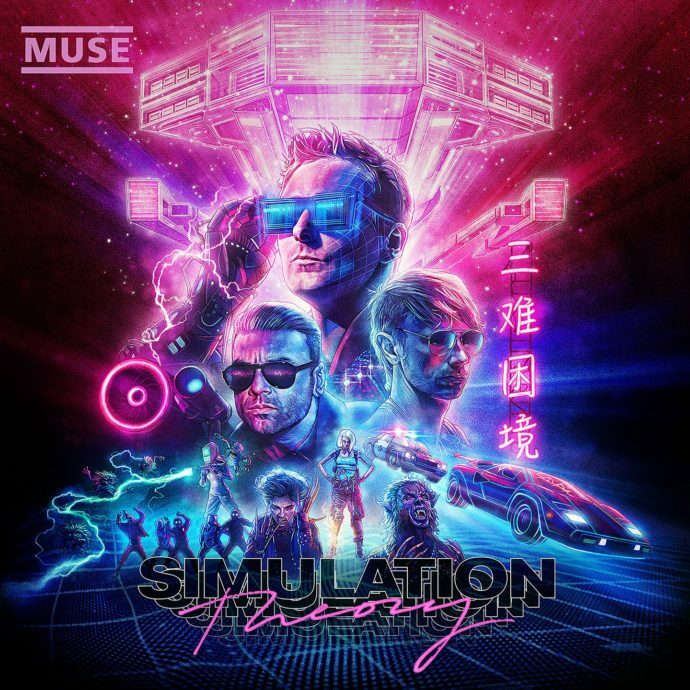 Despite the failed experimentations and a few overly sweet chart-grabs, Simulation Theory has enough high points to vault it to “the best Muse record of this decade” status. Granted the bar was not set too high by Drones and the 2nd Law, Simulation Theory should appease both Muse fans of old as well as continue to grow their legions.